I used to take vitamin tablets every day when I was a kid, given t me as they were meant to be 'healthy' and just top up any nutrients I might not be getting enough of. I stopped when I got to university because I could not be bothered. I haven't noticed any difference whatsoever since then. I'm pretty sure folic acid when pregnant is recommended, but other than that I'm lucky enough to be able to get a varied enough diet that supplements don't seem in any way necessary. Lab Rat: right, folic acid is definitely recommended for pregnant women, for very good health reasons, primarily to prevent spina bifida in the baby. 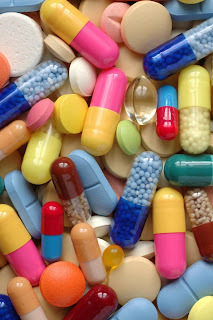 I don't want to suggest that all supplements are bad - it's just that routine use of supplements and multivitamins, when there's no particular reason for them, seems to be more harmful than helpful. You might want to read this entry from Science-Based Medicine, which is on your blog roll. It offers a far more balanced and less polemic view on the matter. You could also read my take on the matter. Breki: I read Steven Novella's blog post at Science-Based Medicine, and it's excellent. He has a different perspective from me, and makes different points, all of them excellent. I highly recommend his article. At your own post you argued that the vitamin E/selenium study is "not newsworthy." I can't agree with that. The reason NCI did the study is that there have been multiple claims over the years - some supported (weakly) by preliminary evidence - that both these supplements prevented prostate cancer. NCI funded a huge, very expensive study to investigate these claims, and the result is negative. Negative results like this very much deserve publicity - after years of promoting bogus cancer cure claims from the supplements industry, we need to try to re-educate the public. As for the other study, you wrote on your blog that the investigators "ignored all other possible mortality factors." Actually that's not true either - they acknowledged this concern explicitly and tried very hard to control for it. In an observational study they can't really control things very well, but they acknowledge that too. I should re-emphasize what I wrote at the end of my article: supplements are only needed if you have a deficiency in a vital nutrient. In that case, they are vital to your health. But as both of these new studies pointed out, an excess of certain vitamins and supplements can be harmful, which means that routine use of megavitamins - which is quite common in modern society - can do more harm than good. I just reread Novella's column and can't see much difference in the basic conclusions or advice. Eat your veggies (and fruit) and there's little need for vitamins. I'm in total agreement. The only quibble I have is that millions eat little to no veggies or fruit and refuse to change their ways. The question then is: should people with relatively poor diets (in terms of nutrients, not calories) take a multiple vitamin? I used to do this before I ramped up my veggies to include every color most every day. I would also argue that not only is spinach tasty--raw or cooked a bit, but so is kale, collards, chard, all colors of beets, carrots and peppers, as well as cabbage, broccoli and brussel sprouts. I have some recipes that have induced my entire family and many friends to beg me to make kale-beet salad!